Yet somehow in the eye of the hurricane you can find love: the love of my son’s fiancé, of my now daughter-in-law Sydney, and my granddaughter, Sienna. They are proudly biracial. Sydney is considering law school. I suggested that she become a Marquette Lawyer. 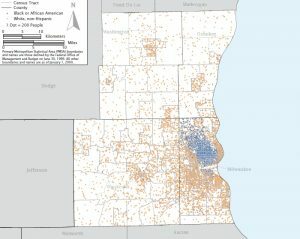 She said “no” because Milwaukee and Milwaukee County are too segregated. The truth hurts so much. In this blog on May 1, 2018, 3L Andrea Jahimiak commented on the pending ACLU lawsuit against the Milwaukee Police Department alleging that its officers routinely conduct unconstitutional stops and frisks motivated by race and ethnicity. Given our own very segregated city, is this really a surprise? Andrea closed out her blog entry hopefully noting that the “class-action lawsuit is forging change But only time will tell.” I hate to say this Andrea, but time is indifferent. Rather it is what you and I fill our time with that makes all the difference. I have had the opportunity to handle several civil rights Section 1983 cases since becoming a Marquette lawyer. I have represented too many young African American men injured or killed by racist unlawful conduct. This includes Tandy O’Neal, who was shot in the back in the course of a SWAT warrant entry into his apartment for a dime bag of marijuana. Tandy O’Neal was left paralyzed in the shooting that was called justified by the district attorney’s office, yet in depositions the officers admitted lying in their reports. Other former clients include Justin Fields, a young college student, shot in the back and killed over basically a parking incident, and more recently 22 year old Adam Trammell, who needed mental health care in May of 2017 but instead was tased him at least 15 times by police officers while he was naked in his bathtub. Adam died in their custody. Time does not tell. And it is not just an issue of bad policing or bad police. There are many honorable officers who serve and protect all the people. The central problem is the objective state of our own segregation from each other. So I am asking my law school and fellow Marquette Lawyers to weigh in and to help deconstruct our segregated reality. I want my daughter-in-law and my granddaughter to want to visit Milwaukee and even live in Milwaukee. To feel safe. To feel loved. To be recognized at first glance as fully human. Following “a recent incident of racist behavior on campus” this spring, President Lovell and the leadership of Marquette University claimed they were “not blind to the challenges that our society and Marquette face” and that we all “must do more” to be inclusive, civil and committed to diversity. If this is what we are now going to do, I suggest the following as the next two steps on the road to the complete deconstruction of our segregated existence and the creation of a new Milwaukee. First, in reading the proposed settlement agreement in the class action lawsuit referenced by 3L Andrea Jahimiak, I observed that it called for a consulting firm from Chicago to monitor the MPD. So I am thinking, why is it that Milwaukee and Marquette Law School are incapable of performing such a basic function? 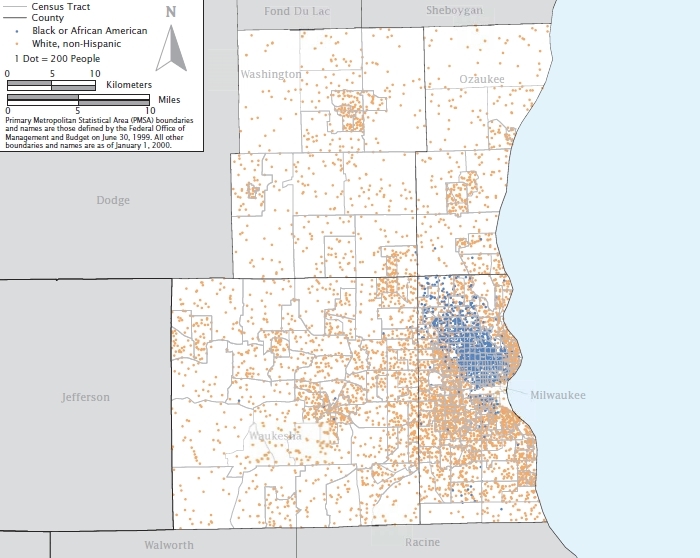 Is it that our deliberate indifference to our segregated existence precludes us from even imagining and monitoring a more perfect union, at least in Milwaukee County? Why couldn’t Marquette Law School use its convening power, through for example, “On the Issues with Mike Gousha,” to laser focus us in deconstructing our segregated existence. The Racial Justice Program in February 2017 was well received. Why not institutionalize the program? Let’s hold two programs each year committed to racial and economic justice. Let’s spend the next 25 years measuring how we deconstruct our segregation and create economic and racial equality and justice in our community. Let’s hold ourselves accountable and measure our progress. Second, I humbly suggest the first “issue” we measure is the state of mental illness and the criminal justice system. Dontre Hamilton suffered from mental illness yet he was gunned down and killed on April 30, 2014. Adam Trammell needed mental health care but was tased over 15 times naked in his bathtub and died in police custody. Terrill Thomas, who only needed mental health care, died from dehydration in our own county jail. We need to act to stop this! It is not the duty of law enforcement to treat the mentally ill, it is our duty. As the Fair and Just Prosecution Mental Health Innovations Site visit (Miami-Dade) Material notes: “People with serious mental illness are more likely to be killed by the police;”“Jail conditions can be harmful to the mental health of those in custody;” and “jailing people with mental illness poses an enormous financial burden while community mental health services represents a cost-effective alternative.” If the Miami-Dade Criminal Mental Health project can be successful in Florida, it can be successful here. See Decriminalizing Mental Illness – The Miami Model – New England Journal of Medicine, 2016. Marquette Law School has significant convening power. Our County Executive, our County and Municipal governments, our city Mayor and other city elected representatives, our major health care players, our judges, law enforcement, community organizations, and our District Attorney John Chisholm, who is already advocating for this “radical” change, can be called to convene this fall to actually start to solve the problem created by our deliberate segregation. We are planning for a new mental health facility yet the plan does not appear to fully maximize the benefits of a true reboot. St. Joseph’s Hospital serves our African American Community. Yet, its very existence is on life support. If Miami-Dade can do it, i.e., create real meaningful changes, why doesn’t Milwaukee? And why don’t we do it now? After all, we took an oath to form a more perfect union. To create effective change the message has to be extended outside of Milwaukee County to Washington, Ozaukee, and Fon Du Lac counties. People will need to understand the segregation experienced in Wisconsin is designed and only through education can integration occur. Previous Previous post: Foxconn Water Diversion Approval to be Tested in Administrative Hearing; Judicial Review to Follow?